I have also added (in yellow) some comments relating to musical ability for each sign, from the website astrologycom.com. It seems that composers are almost twice as likely to be born under Aquarius as they are under Virgo, with the other signs falling between these extremes. For a sample of this size, this is statistically significant – i.e. it is extremely unlikely that there is no great difference but that the sample of composers just happened to include a disproportionate number of Aquarians compared to Virgos. I must admit, I was not expecting this. Perhaps there is a logical, or at least an astrological, explanation. The descriptions on the astrologycom.com website do seem to support the result, in that four out of the five comments relating to musical ability fall in the top half of the table (although the likelihood of this happening by chance is only about 1 in 8, so it is not hugely significant). There may or may not be something astrologically important going on here. There are, however, three errors in the statistical analysis. The first is that we have looked at the data before deciding what to test. We drew the chart, discovered that Aquarius and Virgo were the most and least common signs, and then tested whether the difference was significant. In any sample split between several categories, if we test the highest against the lowest, then the difference is quite likely to look significant – as we have chosen the two categories most likely to do so. What we should have done is to decide in advance that we were going to test Aquarius against Virgo – before we knew that they were the highest and lowest categories. If we had decided to test Capricorn against Libra, say, then we would not have concluded that there was anything significant going on. The second error is that we are making a statement about the distribution of star signs among composers without considering the distribution of star signs among the general population. 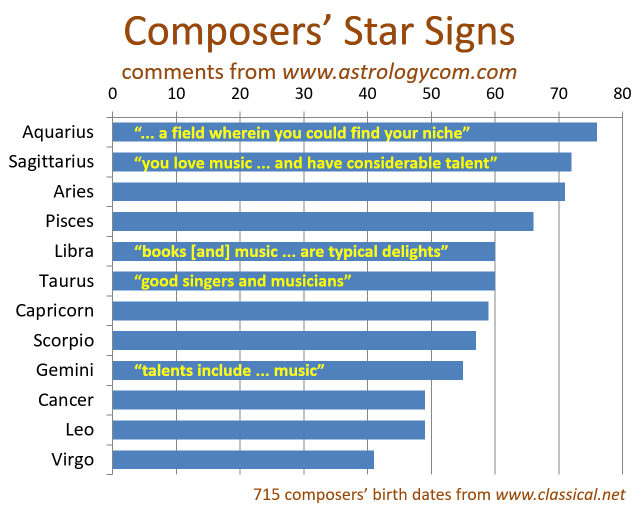 The fact that composers are more likely to be Aquarius than Virgo is not very interesting if the same is also true of non-composers. 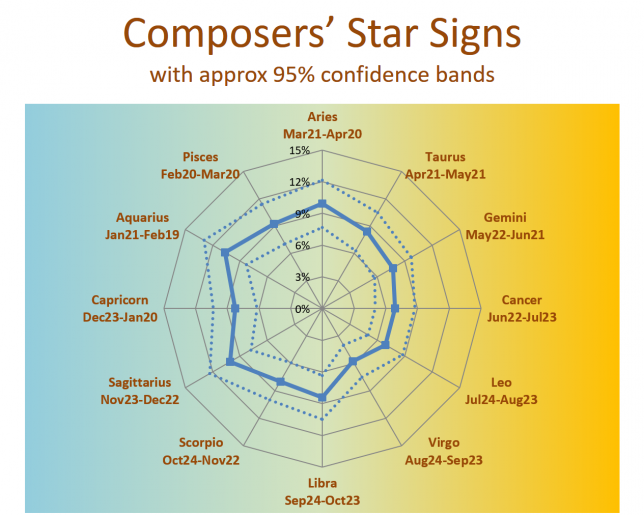 Put another way, composers being most commonly Aquarian does NOT imply that Aquarians are more likely to be composers than those born under other signs. It might just mean that there are more Aquarians in the population. The background colour indicates winter on the left, and summer on the right, and we can clearly see that more composers are born in the winter than in the summer. This seasonality of birth rates across the year is quite normal. I have looked at several datasets of different populations, and they tend to show a similar pattern. Although there are some differences over time (the period since 1950 is different, for example) and between parts of the world (e.g. Europe, the US and the Southern Hemisphere), the pattern above is typical of predominantly European populations weighted towards the nineteenth century. Cite this article as: Gustar, A.J. 'Lies, Damned Lies, and Composers’ Star Signs' in Statistics in Historical Musicology, 31st December 2017, https://www.musichistorystats.com/lies-damned-lies-and-composers-star-signs/.